Everyday millions of children travel to school in India. Some use school bus, some walk down and many use motorised modes. So, have we ever thought of the risk factors surrounding the lives of these young ones? Ignoring traffic signals and jumping red lights is a very common phenomena that one sees in the school zones. Motor vehicle is increasing by 12% each year and is projected to increase at a very rapid pace. This increase in motorisation will have huge implications for air quality and road traffic injuries. Not only this, the rising number of schools in your neighbourhood will also invite equal number of private vehicles. This simply means that the schools have to be more alert and cautious of the safety systems. Some schools do try to manage the traffic but the chaos seems to be unmanageable. Do we question the safety of school journeys? Unfortunately, even the Indian law doesn’t!! lack in stringent laws and safety awareness leads to disastrous scenes around the school zones. There are many reasons to question the current status of our legislative framework, Road safety policies, Motor Vehicles Act or the Road accidents near the school zones. However, there are some human factors which cant be ignored and questioning them becomes more critical. I am an Anthropologist and studying different aspects of the human behaviour is very close to my heart. I truly believe in decoding why people do what they do? We humans struggle with time management every single day. Doing everything on time is a task with which we suffer 24 hours. Being punctual is considered to be the one big thing, though the studies now show that people who are late are more successful! This is one dicy situation which will never have any valid or logical conclusion. Parents who go to drop their kids to school wants to fly with some godspeed in order to reach school well in time. Reaching school timely is some punctuality and discipline issue which have been ingrained in our minds since ages unknown. It is this pcychological pressure to which we all succumb at some point of time. It is this urgency of the morning hours which is highly stressful for a normal human being. Adults who acconpany children to schools are defintely accountable for their safety but the state of mind of those adults should be a bigger concern as it directly reflects on the way they commute/drive to schools in the morning. 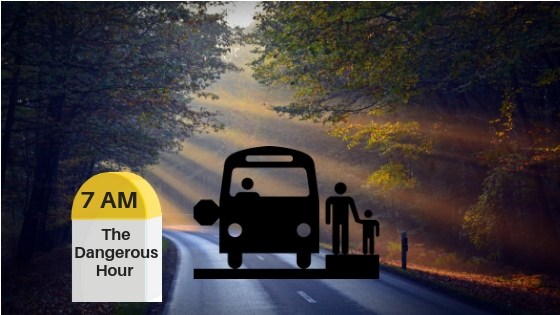 Every year thousands of school buses and vans are penalised for rash driving or for flouting the norms. Morning rush hour is the worse for working parents as the fear of reaching on time to both office and school makes them drive recklessly. Most of the road fatalities are the result of errant drivers who just ignore the safety of children and keep their life at stake. As a country we have come so far in every aspect but as a happy and safe place we are still lacking way behind than most of the countries. It all about fear which is unfortunately not seen due to the lack of stringent laws. Hence, adhereing to traffic laws is still a distant dream in this country. Till the authorities wake up and take some mandatory actions, we leave you with few tips to minimise the risk during school commuting. Previous story Are we failing as Humans?